I’ll just say it, I like to play with pattern. Like, a lot. 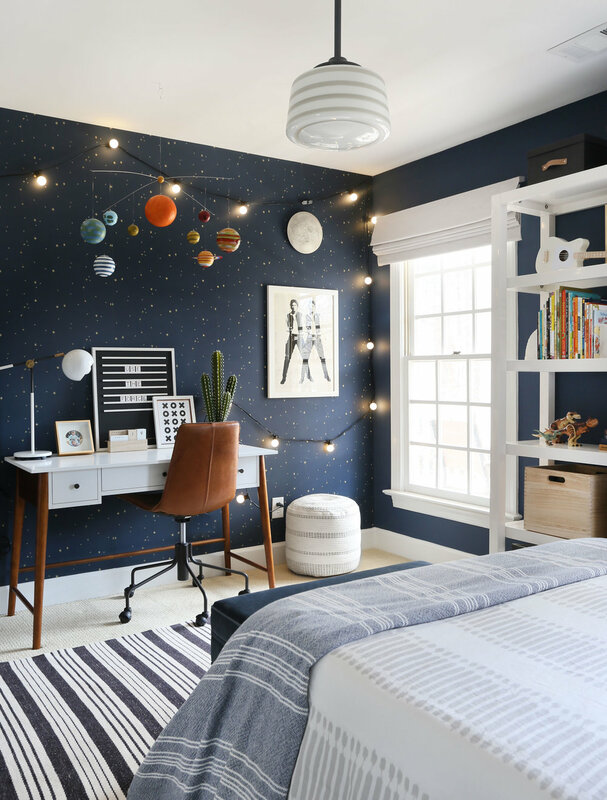 In all spaces, but especially in a kid’s room where you can break some rules and generally just have fun. 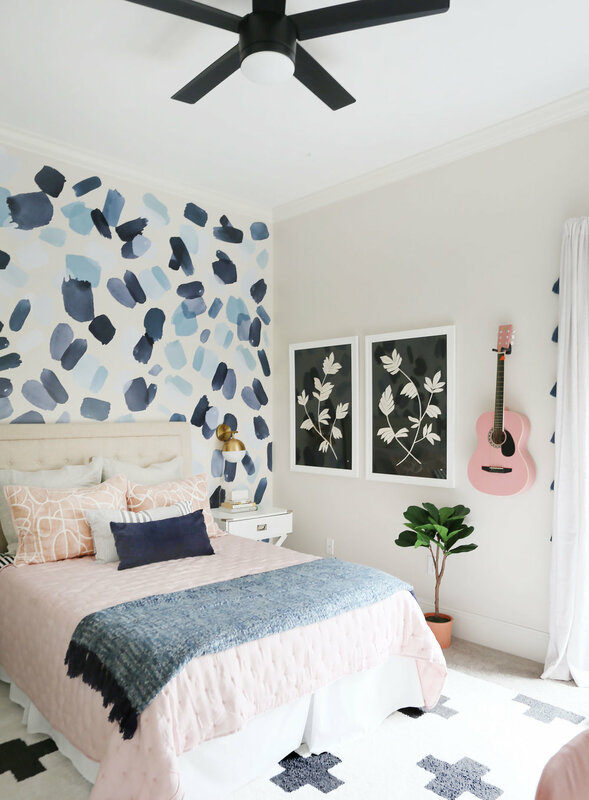 I recently had the opportunity to design and style this bedroom, belonging to an 11 year old girl, who wanted a more grown up space to better reflect her own style and personality. As you can see, she is creative, musical and a very cool young lady! We re-purposed most of the furniture and just added in layers of style with rugs, textiles, affordable lighting, accessories and that amazing wall treatment. My client wanted her daughter to have a new space but didn’t want to invest a ton in expensive home decor because…well…kids. lol They still deserve all of the cuteness though, so let’s get into the details. 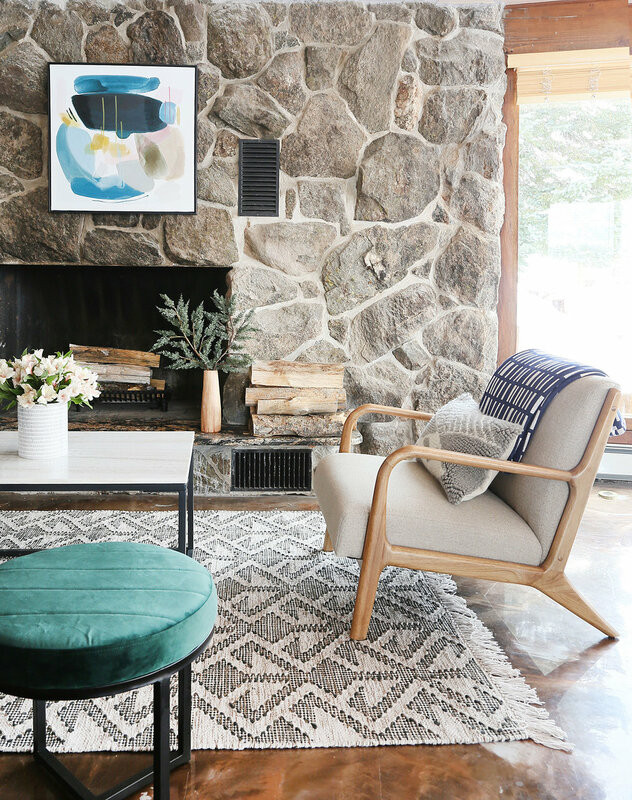 We chose that gorgeous Scandi-inspired shag rug from one of my go-to’s for affordable and high quality rugs, Boutique Rugs and layered it over the existing neutral carpet. It’s so soft under foot and does not shed! 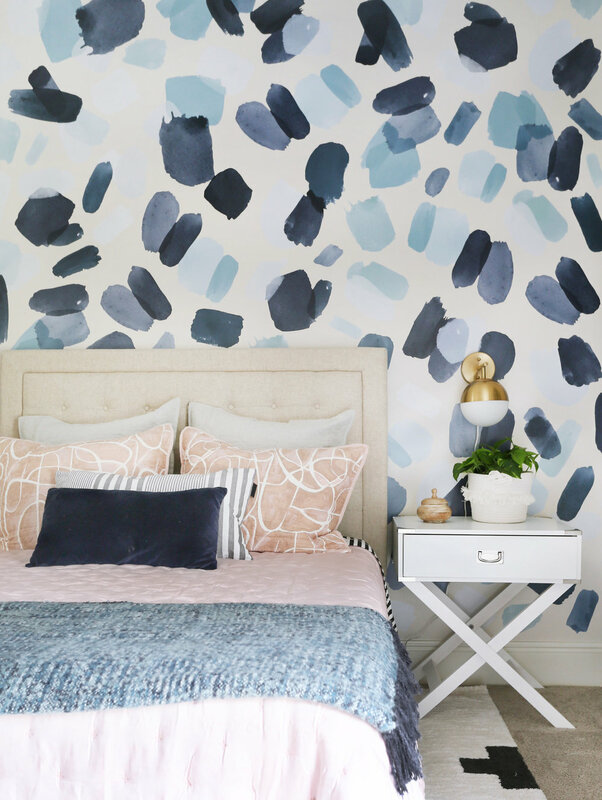 I went back to my friends at Urban Walls and found that beautiful indigo brush stroke pattern, which perfectly carries that wall without anything else. Its stunning and impactful and it’s decals! Yep, essentially stickers that we installed in a couple of hours! I can’t say enough good things! Good lighting goes a long way and can make a big impact in the styling department. We installed those amazingly affordable plug-in sconces on each side of the bed in under an hour and it immediately elevated the room. They are beautiful and incredibly well made especially for being $49.99! And that PB Teen task lamp had us all wanting to steal it! It’s really really good and looks so elegant on her desk. Also, did I mention its USB compatible! 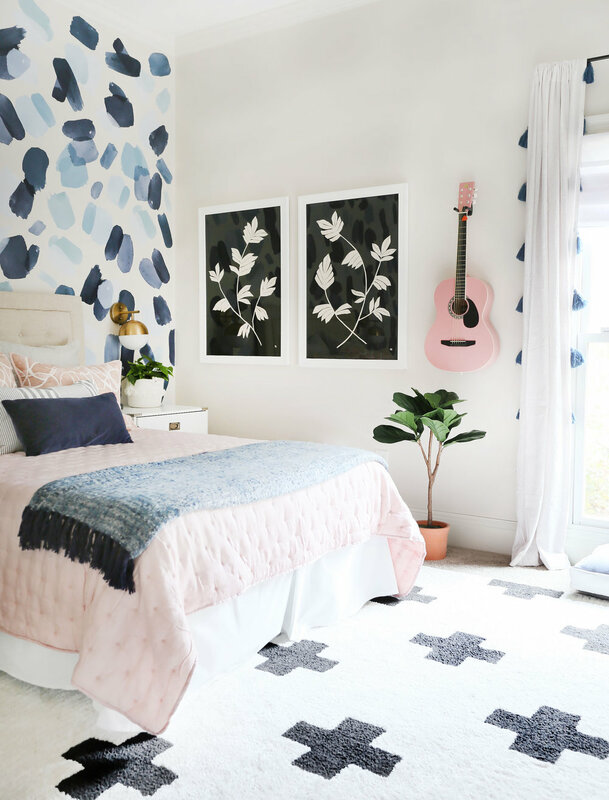 We found that soft and dreamy quilt from PB Teen and paired it with those black and white sheets for a little unexpected pop of pattern when you climb into bed. 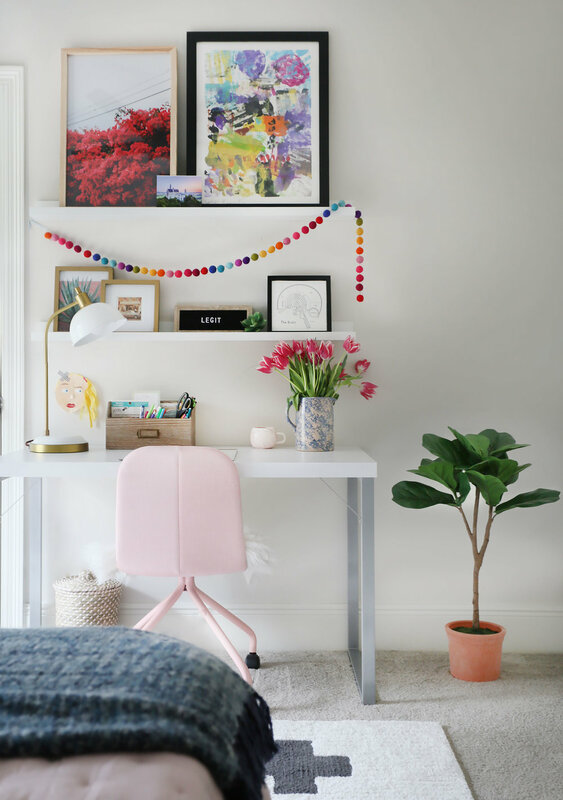 I love the softness from the pink paired with the graphical elements in the room. Pinks + blues forever and ever! Don’t underestimate the power of the accessory! I’m not talking a ton of tchotchkes, but a tasteful amount of interesting and personal decor items to really give a room some character. Take for instance the knobs on the Ikea credenza (which my client has had for 15+ years!). We swapped out the ones that came standard for those playful wooden pulls found at Hobby Lobby for under $5 each. 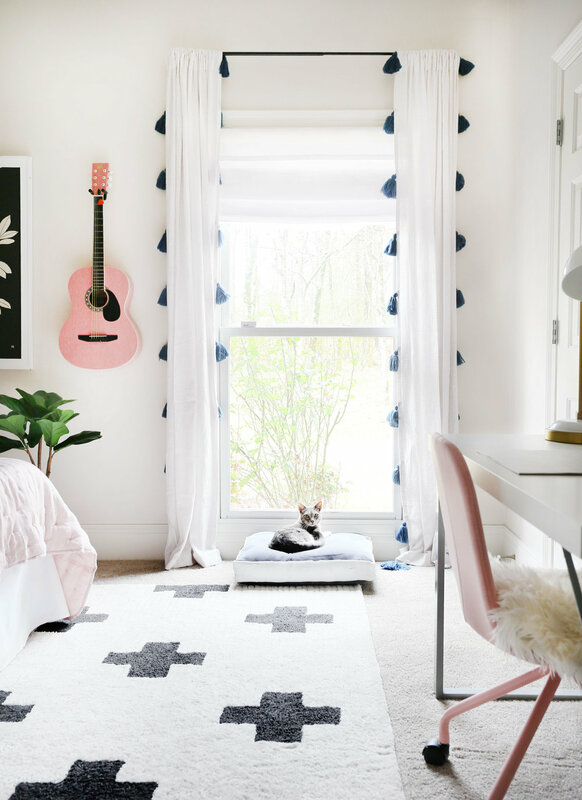 This is a very musical family, so incorporating her guitar was a nice way to add character and personal style to the room. And also, how cute is it?! I want a pink guitar in my bedroom! Isn’t it amazing what few little pieces of decor can do to lighten, brighten and add easy style to a room?! I love how it came out as did my client who was so excited to have this very cool space to call her own. If you are curious to the sources, I got ya covered below! There is something so satisfying, calming and oh so beautiful about a well-organized space (or even a drawer or cabinet). I’ve touched on this before here and I feel very passionate about this subject. When my home is clean(ish) and organized, I feel like I can take on the world and really focus! It’s the best! And is there a better place to go to find all of the beautiful, functional and well-made storage pieces than The Container Store? The answer is nope! And by the way, this post is 100% not sponsored (I wish…I tried…and they said no but I’m not hating) ha! This place is like crack to me! And the bad news for me and good news for them is that there is one right down the street from me. Yikes! Give me ALLLL of the gorgeous canisters, baskets, office supplies, closet stuff, cleaning stuff….. 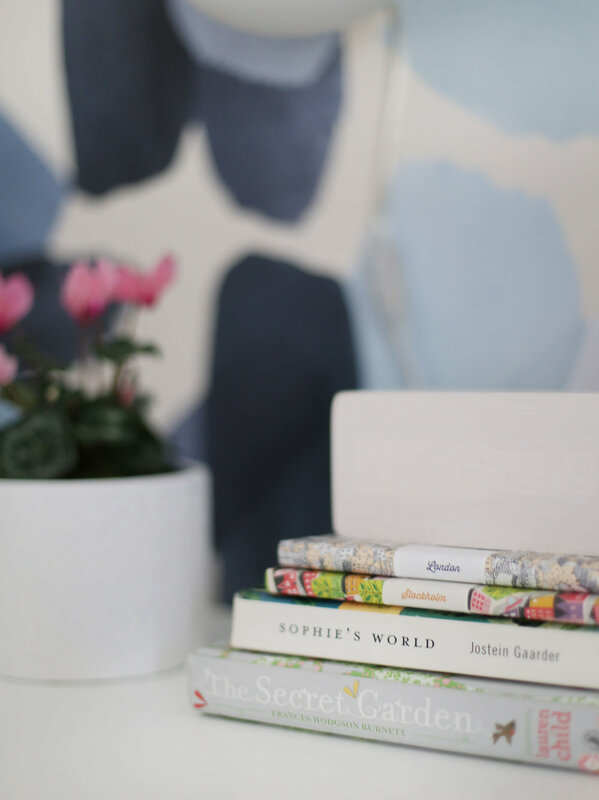 I could go on and on but instead of being too long-winded about my passion for this brand, I’ve rounded up some of my favorites below (and I had to pare this list way down). I think I might actually own most of these items, so you are getting raw and honest feedback! To get a direct link, hover over the item. 1 / I love how this has different levels for different fruits (or whatever you use it for). I’m thinking about those onions and bananas! 2 / The cutest, most playful hooks! I bought one for my son’s room. 3 / These baskets are so elegant and well-made! 4 / The cleanest and best smelling stuff to wipe down any surface. I’m on my second bottle! 5 / I’m eyeing these for my pantry makeover that started today! 6 / There are many of these cuties in my spice cabinet. 7 / Love the Scandi style! I use these to store small garments and socks! 9 / Love the pops of color from the tops and these make great storage for smaller dry goods. 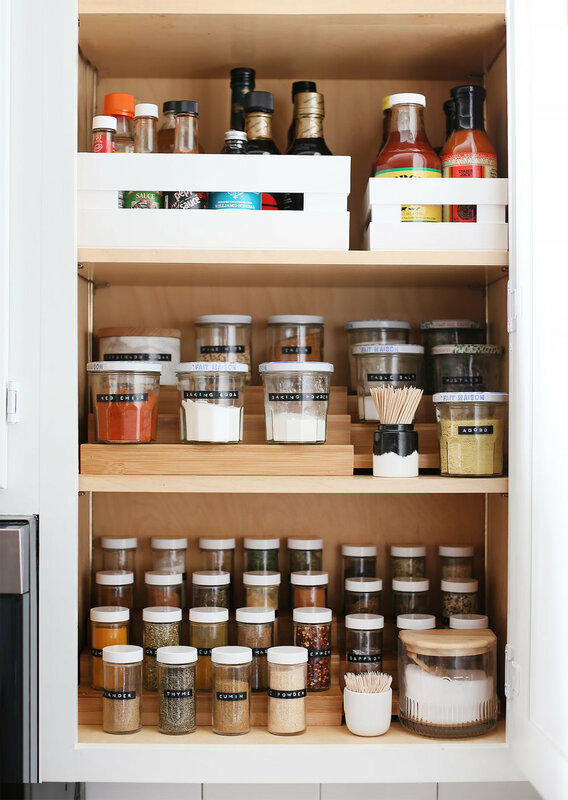 10 / Have this and love it for organizing my spices! 11 / I love this to keep up with my weekly tasks! It’s old school but I have found using it to be very effective! 12 / The cutest little pouch to store your biz cards! I have the copper color. 13 / I used these on my son’s bookshelves and they are super roomy and well made! 14 / Raise your hand if you love a good writing pen??! (hands way up in the air) These babies are awesome. 15 / My under sink storage never looked so good! 16 / I’m in on anything with leather pulls! 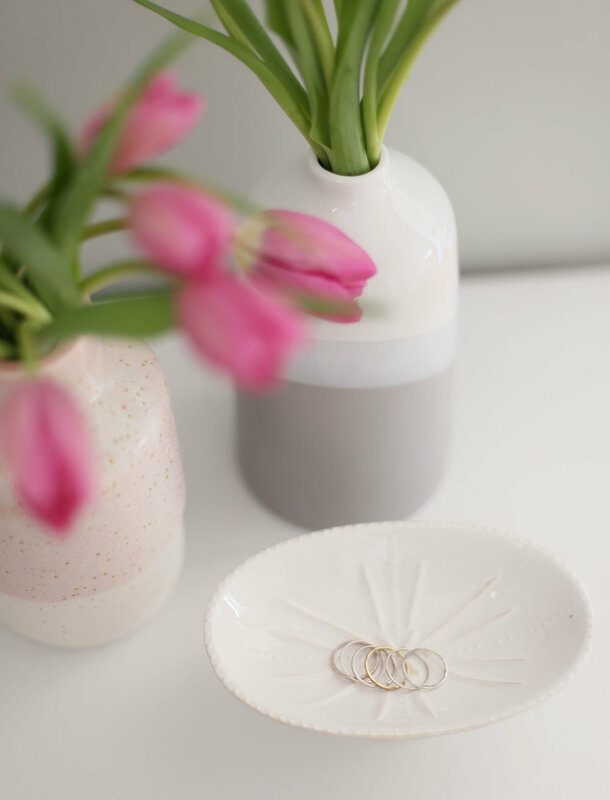 Spring is in the air (especially in NC where things are already starting to bloom) and I will take any opportunity to freshen up a space to reflect a warmer and sunnier vibe! Our entryway is a small little nook directly to the left when you walk into the house. And while it is certainly not a grand foyer, I still believe it’s important to set a warm and welcoming tone when you first walk in, even in the smallest of spaces. 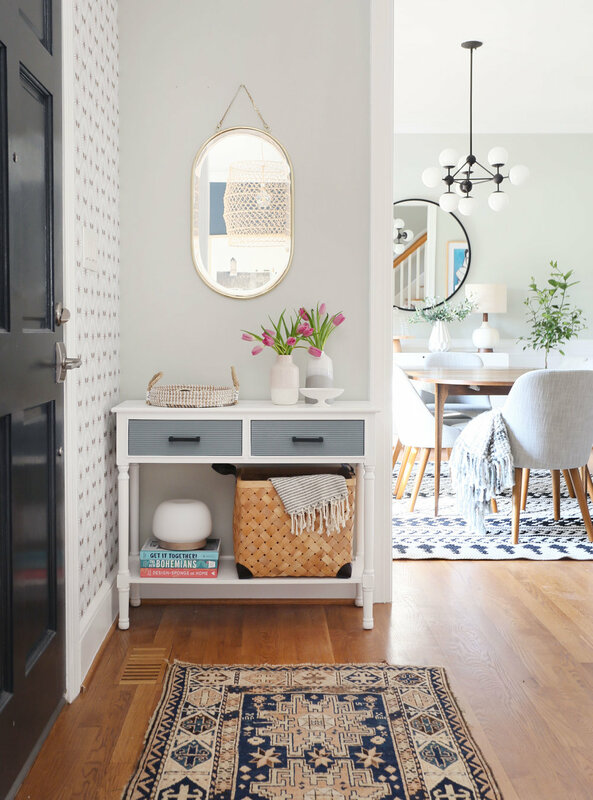 Today I’m teaming up with Home Centric to share a few tips for styling an entry space on the smaller side. Let’s dive in! First consider (and measure) the space you have to work with and choose your entryway table style based on that. I found that great little traditional table at Home Centric and I knew it would be perfect size for the space. I loved the shape and stye but wanted to break up the white and give it a little bit of pizazz so I painted the drawers that dreamy blue color (De Nimes by Farrow & Ball) and added simple black pulls. I love it! You could also go with a small bench for extra seating too! Add a plant or some fresh flowers and pair them with a pretty vase! You could even use faux if that is simpler – just make sure you have a bit of color and organic texture in the mix. I found those amazing Scandi-inspired vases at Home Centric and they are the perfect tulip vessel! Pro Tip: Tulips are one of my go-to affordable and elegant options for fresh flowers! Check your local grocery store for the tulip bin – you can typically get a bunch for around $4.99. A mirror is lovely in a smaller space as it bounces and reflects light and makes the room feel a bit bigger. 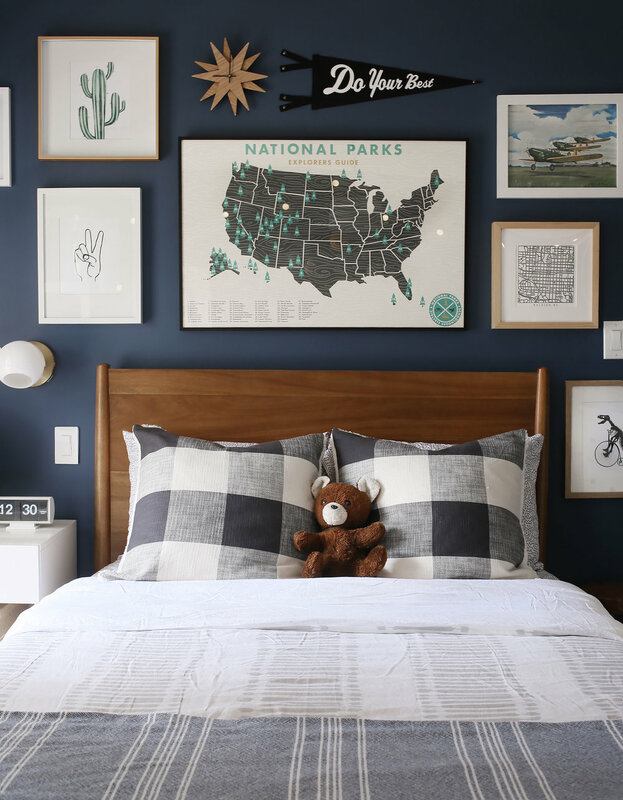 You can also hang your favorite piece of art to add some of your own personality and style to the mix. Layer in things like books, textiles and small decor pieces to add personality and texture. Remember the the rule of three – objects look better in a group of three. And keep balance and space in mind when choosing items for the table top. And that’s it! I put together a handy little graphic to summarize it all up below. This post is sponsored by Home Centric. All thoughts and opinions are my own. Thank you for supporting content that keeps Sunny Circle Studio going! A few months back, I had the pleasure of flying out to Denver to style a mountain home that was recently purchased by my dear friend-turned-client. From Denver, we traveled about an hour into the Rocky Mountains to the town of Winter Park. It was a literal winter wonderland when we arrived (and this was in early December). Snow-covered trees, super friendly folks, lots of delicious treats. I just love Denver and Colorado in general - such a cool and progressive place that I could totally picture myself living and thriving in! Anyways…back to the house and a little bit about their story. It’s a large A-frame cabin built in 1965. They purchased it as part investment property and part family mountain home. My client and I go pretty far back and had always shared a love of design and style in our 20’s, so when the opportunity arose for us to work together in our..ahem…late 30’s, I was totally on board! Let’s take a quick look at the pictures of the home when they got the keys. Kinda dated, a bit dark and very rustic! Scroll through to see! My clients didn’t want to spend a ton on new furniture and decor, but did want to put a little love into the house. 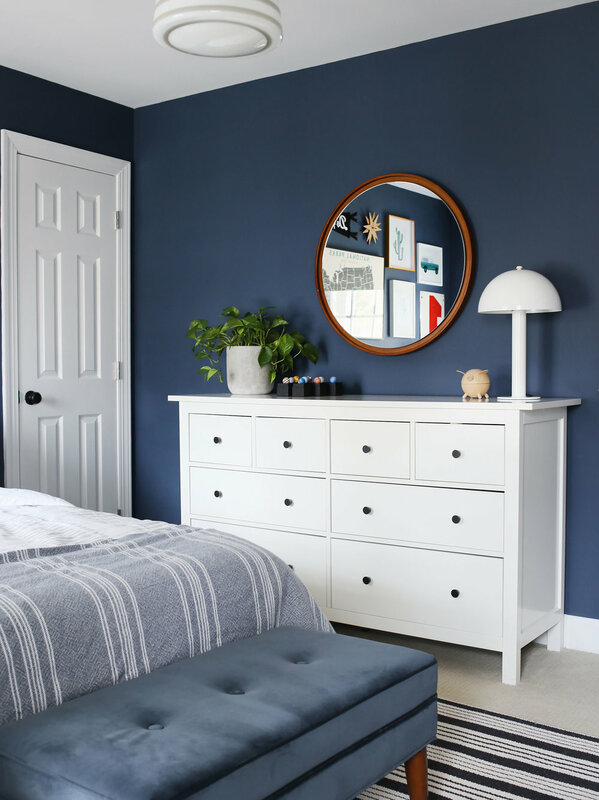 They painted several rooms with a fresh coat of white (one of my faves: Benjamin Moore’s Chantilly Lace) and picked up a few new pieces from places like AllModern, Target, World Market, Home Goods and West Elm. 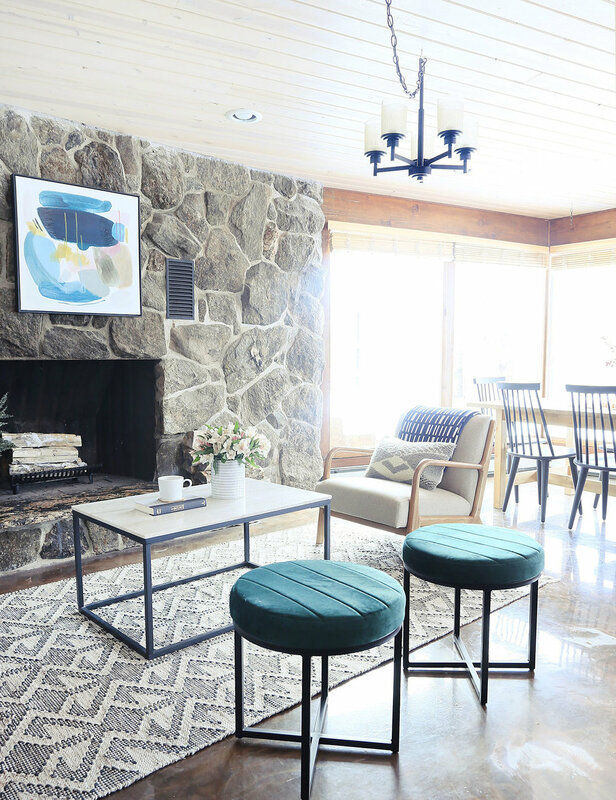 On top of all of that, we layered in staples like modern art pieces, rugs, throw pillows and accessories to create a welcoming and cozy retreat for them and their guests! They wanted the home to feel comfortable and modern with touches of rustic. We added fresh pops of color via textiles, accessories, plants and small pieces of furniture to bring a modern balance to all of the brown and beige from the ceilings and floors. The house has amazing 360-degree mountain views, is in a great location on 5 private acres less than 10 minutes from downtown Winter Park, and has a ton of design potential that they may one day tackle. In the meantime, they are enjoying using it in the evenings after a day on the slopes. They also have a killer saltwater hot tub and a massive kitchen that can accommodate a large crowd. If you are interested in visiting this cabin and the amazing area (both in the summer and winter), go here and book a weekend! And, as always, I pulled together the sources (or similar options) in my handy little graphic below. 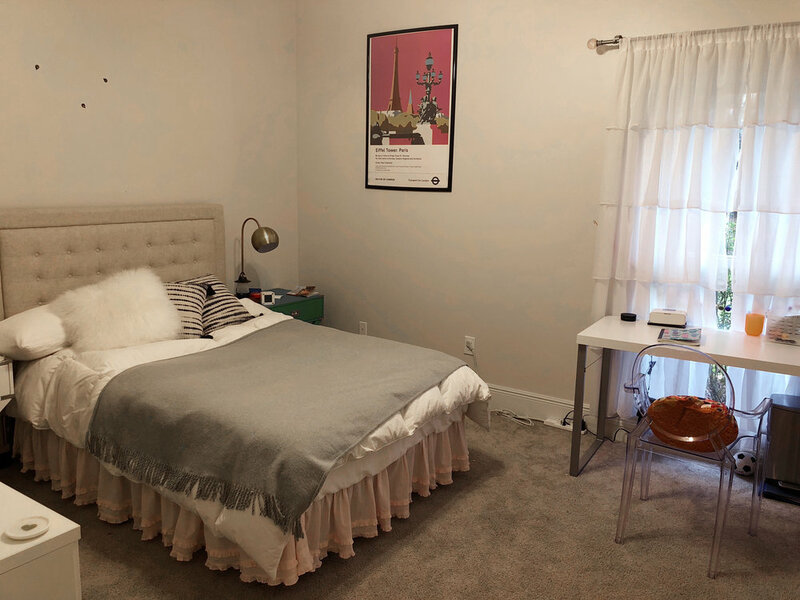 Home Tour: A classically happy New Orleans suite + giveaway! Hello and welcome to this comfy little slice of New Orleans heaven! This recently renovated classic Creole cottage is the little sister to the Nola Happy project I shared on the blog last year. This one bedroom and 1 bath suite is wonderfully comfortable and cozy and makes use of all it’s 400 sq ft with a full kitchen, living room, bathroom and bedroom. The owners wanted to create a stylish, private and comfortable place for family and friends to stay when they are in town visiting, and they also rent it when available. In honor of Mardi Gras, I’m teaming up with the folks at Nola Happy Home to give away a 2 night stay in this amazing space! You can find more details and how to enter here. The space is small but has an amazing flow that makes it seem spacious (I should know as I stayed there for almost a week!). It’s the perfect place for a weekend getaway to explore New Orleans. The home was thoughtfully styled by Matthew Birmingham with a little help from yours truly in a few areas (I will always love a good throw blanket across a sofa). Isn’t that bathroom so fun?! I worked with the owners to select the tile, finishes and accessories. We chose classic subway and hex tiles and added a playful edge with the floor design. Its such a bright and happy spot to get ready in the morning! The kitchen is the brainchild of local designer Angela Murtagh. She worked with the owners to design the layout and utilize the tiny space in the most clever ways! Trust me when I say that it’s a very comfortable and chic little space to enjoy your downtime in! You can find more info and book a weekend getaway here.